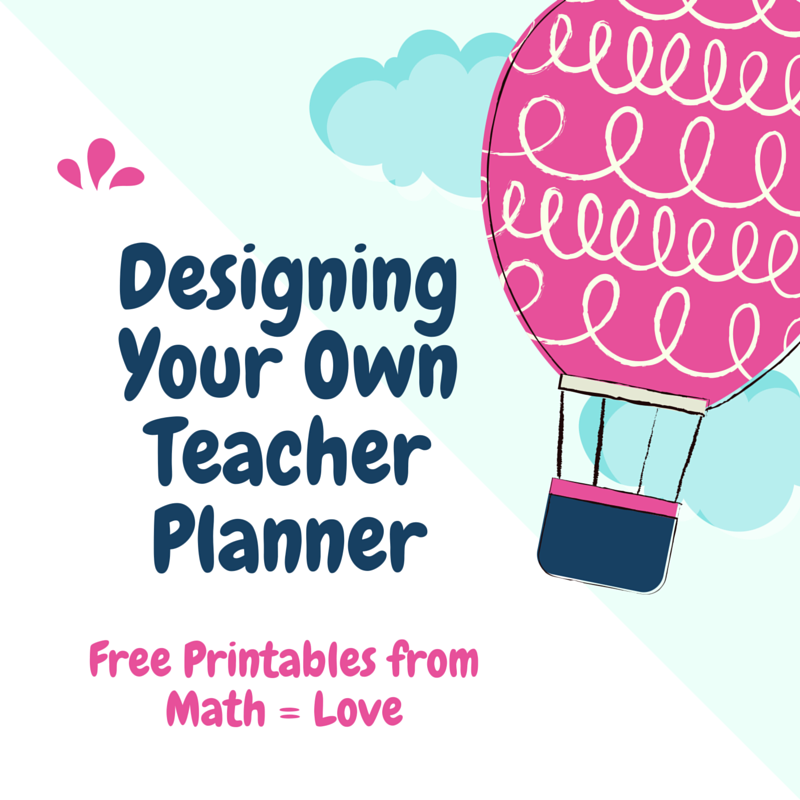 I'm in the middle of designing my own teacher planner for next year, and I'm too excited to wait until the final product is done to start blogging about it. 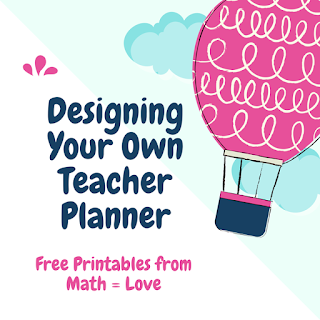 I love browsing the internet for pretty teacher planners. There's just something about a new planner that makes me happy inside. However, the problem with most planners that I see on the Internet is that they seem to be focused on the elementary grades. I don't need field trip planners or a zillion pre-made seating chart pages. I started thinking about what I would want in a planner, and this is what I came up with. Really, when it comes down to it, all I want flexibility. I want to be able to change things when they aren't working. I'm tired of buying a planner and spending a year dreaming about when I get to buy a new planner because it just isn't working for me. My husband introduced me to the Arc Notebook System by Staples a couple of months ago. It's a discbound system that lets you rearrange your pages to your heart's content. You can add pages whenever you want and wherever you want. It gives me the flexibility of a three-ring binder without the annoying bulk of a binder. Plus, it lies completely flat! I designed my own weekly spread back in May, and I've been using it to see what I *really* want in a planner. After using my own pages for a few days, I figured out what was working and wasn't working. I've redesigned my weekly spread pages, and I'll be blogging about those soon. Promise. What I really want to blog about today is the "extras" I have made to go in my planner to keep me organized. All of the pages in this post can be downloaded here. If you download the editable Publisher files, you'll need to also download these free fonts: HVD Comic Serif Pro and Ostrich Sans Heavy. The PDF files will preserve all of the fonts and formatting. Address Book Pages - One thing that planning a wedding (and writing post-wedding thank you notes) taught me was that I need a better organizing system for my addresses. Calculator Sign-Out Sheets - My school provides students with graphing calculators instead of making them purchase their own. This is largely because we are in a low socio-economic area where many families could not afford to purchase a graphing calculator for their students. I have a classroom set of calculators that serves us well. The problem arises when our students need a graphing calculator to take the ACT. In four years of teaching, I still haven't come up with a good system for tracking who has borrowed which calculator. Usually, I resort to writing calculator numbers down on post-it notes, but they can get buried in my messy desk and lost. If students seem me write down their calculator check-out in my book, they'll know that they must return it in a timely manner or I will track them down. Birthdays - One thing I want to do a better job of this year is keeping track of birthdays. When someone takes the time to send you a birthday card, it just makes you feel special. I want to do that more this year. I overheard a student say a couple of weeks ago that only one person had wished her a happy birthday on her birthday. Her own parents hadn't even remembered her birthday. How sad is that! This was convicting to me because I only do an okay job of recognizing birthdays in my classroom. Usually the way I deal with birthdays is this: If you tell me it's your birthday, I'll give you a birthday badge sticker to wear. Sometimes, I'll even throw in a "Happy Birthday" certificate that I picked up at Dollar Tree. What about the students that are too shy to tell me it's there birthday? I need to make a plan to recognize all of my students on their birthday. I still remember my 7th grade math teacher: Mrs. Sellars. She gave each of us a pencil on our birthday. If students had a birthday that fell in the summer months, she gave them a pencil on their half-birthday. This year, I want to recognize all of my students (and coworkers) on their birthdays. To help me keep track of this, I made some birthday tracking sheets to keep in my planner. I haven't tested these out yet (mainly because I've yet to print all of my planner pages and assemble them.) I'm thinking that the student birthdays sheet might be too small to fit all of my students. So, I might need to redesign it so it takes up 2 pages... If so, I'll share it as well! Future Dates - I'm always running into the problem of having a date I want to put in my planner when my planner doesn't go that far. I decided that making a sheet to record dates for the next four years should help with this. Now, I have a place to record random dates I want to keep an eye on such as driver's license expirations, teacher registration expirations, and other random stuff. Items Borrowed and Items Loaned - I perpetually have students coming to me to borrow stuff. After four years, students have learned that if you need scissors, glue, colored pencils, markers, rulers, or any crafty stuff that I'll probably have it. The problem is that these things have a tendency to not come back. I'd track down the student who borrowed it, but I often don't remember who that was. And, I often don't realize it never came back until a week or so later. This year, I'm going to keep a log of items that are borrowed so I can ensure that they are returned. Students won't be able to leave the the room with the borrowed item until it's logged in my book. I also created a sheet for items that other people have loaned me. It's rare that I borrow something from someone, but it does happen. Meeting Notes - I have a new principal next year who promises that he rarely calls a faculty meeting. My previous principal insisted on having a faculty meeting every Friday. Even though there will be less meetings to attend, I still want to keep organized at these meetings. My usual approach to a faculty meeting has been to take notes on a calendar page in my planner. This is usually less than ideal. So, I designed this sheet to help me organize my meeting notes. Student Council Meeting Notes - As Student Council sponsor, I host a usually weekly meeting for my student council kids to discuss upcoming events that they are planning. I've never been organized with student council stuff, and it makes it incredibly hard to find things later. I adapted my Meeting Notes page to a Student Council Meeting Notes page. I'm hoping this leads to more organized student council meetings this year! Passwords - As a teacher, I have so many passwords to keep track of it's not funny. I've always relied on trying to use the same password if at all possible. This works for the most part. But, there's always that website that wants 14 letter passwords with 5 special characters or something crazy. Keeping track of my various passwords will help me keep my sanity and save time by not having to go through the "Forgot My Password" page at least once a week. Project Planner - Okay, I'm not entirely sure what I'm going to use this for. I might use it in the student council section of my notebook to help various events such as the Veterans Day Assembly or the Annual Blood Drive. I also play a large role in preparing for the Awards Assembly at the end of the year which involves lots of small to-do list items. Reading Log - Now that grad school is done, I think I might finally have time to start reading for pleasure again. I recently got a library card from a nearby town that allows me to access free audio books and e-books. The type column is to differentiate between e-books, audio books, and well actual physical books. Tutoring Log - My school pays teachers to do after school tutoring, but there's one catch. We have to keep a log of our hours and the students we help in order to get paid. I often help students after school, but I'm terrible at keeping records. This means I rarely get any compensation for my time. This year, I am going to have a tutoring sign-in sheet for students to sign when they enter and exit my room. Then, I'll transfer the information (neatly) to my tutoring log. To-Do Lists - I have designed half-sheet to-do lists for this next year. My thinking is that since they only take up half a sheet they can be inserted in the middle of my weekly spread. I've tried keeping my to-do items on my weekly spread, but that just ends up too messy. Plus, I usually have way more to-do items than space. This will allow me to change out the to-do list in the middle of the week if I need to. Of course, you can just print these, chop them in half, and use them as a normal to do list, too! One of my favorite activities from this past year's Algebra 1 class was our Function Auction. When I originally did this in class, I threw it together at the last minute. This meant I grabbed a random worksheet off of the Internet and called it good. Here's my write-up of how the activity went last year. I'm currently in an "overhaul everything" mood for the next school year. So, I decided to create my own Function Auction worksheet. I used images of functions and non-functions from released state questions from Oklahoma, Arkansas, and a couple of other states. The auction catalog features 12 lots. I also made a version with boxes around each lot. For extra fun, make auction paddles for groups to use using colored paper and rulers or paint sticks. If I haven't sold you on the idea of the function auction, I made the function auction catalog into a worksheet. Files can be downloaded here. For the editable Publisher file, you'll need these free fonts: HVD Comic Serif Pro and Aaargh. The PDF file will preserve the fonts and formatting. One of the first things that caught my eye when flipping through CPM's Core Connections Algebra book was a team sort to assign students to groups (or study teams). In the past, I've assigned students to groups in a couple of ways. Usually, I just let my classes choose their own seats. The problem with this is friends like to set by friends when that's usually the last place they need to be sitting. To combat this, I've drawn popsicle sticks in the past for group seating. Students hate it when I do this. I like the randomness of the seating, though. Our first unit of the year in Algebra 1 will be "Fundamentals of Algebra." Our first skill will be evaluating expressions. I know this is something students have done before. The new Oklahoma Academic Standards specify that students should be able to evaluate linear, absolute value, radical, and rational expressions. This also includes non-standard operations like you would see on the ACT. Since students will be assigned seats before we begin the unit, I want to use this as an opportunity to see what they already know about evaluating expressions. So, I've created a deck of cards that practices evaluating linear, absolute value, and a few polynomial expressions for good measure. This will hopefully give me an idea of where my students stand with evaluating basic expressions before we start throwing in radicals and rationals which can be undefined at certain values. My goal for this summer is to create a deck of "sorting cards" for each unit of the year. This will ensure that I actually go through with my plan of changing groups at the beginning of each new unit. Here's the first set. I promise that I double-checked for typos. But, if you happen to still catch one, please let me know so I can update the file! My Algebra 1 students are required to be able to evaluate functions from a table, equation, or graph. Last year, I taught these as separate skills. This year, I've decided to combine them into a single skill so that (I hope!) students can see that we're doing the exact same thing in each case. We're just given the information in a different way. 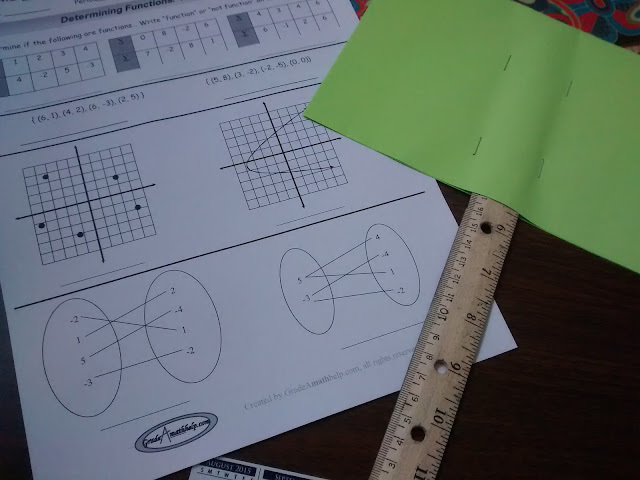 Last year, I played a version of evaluating functions war with my students that I haven't blogged about yet. Oops... It worked well, but it only let students practice evaluating functions from an equation. Last night, as I was laying in bed and trying to think about sleep, I started brainstorming how to make a game that incorporated evaluating functions from graphs and tables, too. I would have liked to include mapping diagrams in this activity as well, but it seemed like more of a hassle than it would be worth. 1. Decide how many students will be in each group. 2. Print one copy of page 2 (evaluation cards) for each student in each group. Printing these on different colors of paper will make it easier for students to sort out which cards belong to who at the beginning of the game. 3. Print one copy of pages 3-5 (function cards) for each group. 4. Laminate (if possible) and cut apart. 1. Shuffle the larger function cards (pages 3-5) and place face down in the center of the playing area. 2. Distribute the smaller evaluation cards to each player. If they are printed on different colors, each player should get 9 cards in a matching color. If cards are not color-coded, distribute 9 cards to each player. Each player should shuffle their deck several times. 3. Turn over the top function card and place it in the center so all players can see. 4. Each player turns over their valuation card and evaluates the function at that value. 5. The player with the highest value wins each of the other players’ evaluation cards. Cards that are won go on the bottom of the stack. 6. Continue play by turning over a new function card in the center of the playing area and having each player turn over a new evaluation card. 7. If two or more players have identical evaluation cards that evaluate to the same highest value, each of those players should turn over a new evaluation card to act as a tie breaker between those players. If two or more players have non-identical evaluation cards that evaluate to the same highest value, a new function card should be turned over to act as a tie breaker between those players. If you have any questions about the rules (or suggestions to make them better! ), please leave a comment at the bottom of this post! * Example: If students will be playing this in groups of three, use three different colors when you print these. If you are printing multiple sets, each group of cards can use the same three colors. You can download the files for this activity here. If you download the editable Publisher version, you'll need to also download these free fonts: Qarmic Sans, Rockwell, and ArmWrestler. The PDF version will preserve all of the fonts and formatting. For the first time in a while, I'm not entirely sure what classes I'm going to be teaching next year. But, I'm 99% sure that I'm teaching Algebra 1. Oklahoma has adopted new academic standards for mathematics, so I need to adapt my previous SBG skills and units to the new standards. I'm also making changes based on my experiences from teaching Algebra 1 this past year. If you're interested, here are my SBG skill lists for last year's Algebra 1 course. Last year, I had 8 units and 58 skills. Below, I'll be posting my new SBG skill lists for this year's Algebra 1 course. This year, I have 12 units and 62 (If I counted correctly!) skills. There are a number of new topics that I have to address this year in Algebra 1 (simplifying and operating on radicals, arithmetic and geometric sequences, solving absolute value equations, systems of inequalities, and a much more in-depth look at probability). I've made several key changes from last year. I greatly reduced the "review" chapter at the beginning of the year. I'm moving a lot of the things I would LIKE to review to my daily warm-ups. These are still in the works, but my current idea is to choose a different review focus for warm-ups for each month of the school year. For example, in August, I think we will start off each class period with a couple of order of operation review problems. We'll start simple at the beginning of the month and ramp up to more complex problems by the end of the month. Another month, we'll focus on integer operations for the warm-ups. I think this will help me still review these important topics without taking up valuable time that belongs to standards actually in the prescribed curriculum. Another thing I've done is combine several learning skills into a single learning skill. For example, I used to have evaluate functions from a table, evaluate functions from an equation, and evaluate functions from a graph as three separate skills. This year, I'm combining them into a single skill of evaluating functions. I think I will still teach them separately, but I will assess them together. I'm trying not to overwhelm my students (and myself!) with too many skills. My husband has been working on SBG skills for Geometry, so I asked him kindly for the template he was using to organize his units. I liked how he included both the new Oklahoma Academic Standards and the old PASS standards that each unit was aligned to. So, I did the same. Are these skill lists perfect? Most definitely not. One of the reasons I want to post them now, well before the beginning of the new school year, is so I have a chance to get constructive feedback from others. So, if you're making your own plans to teach to the new Oklahoma Algebra 1 standards, or if you just like looking at other people's skill lists, I welcome your feedback! So, without further ado, here are my Algebra 1 skill lists. Summer: The time of year where teachers dream of all the things they'll do differently next year. Yesterday, I posted about wanting to do a better job of group work for next year. Erin Flotte left a comment that included a recommendation for a book on group work (affiliate link). I've already ordered it from Amazon and am looking forward to diving in to it this summer. Today, I've been hard at work creating a resource for next year because I know that my intentions to do things differently next year need to be coupled with actions to make that possible. Last week, I read a post on Amie Albrecht's blog about One Minute Surveys. 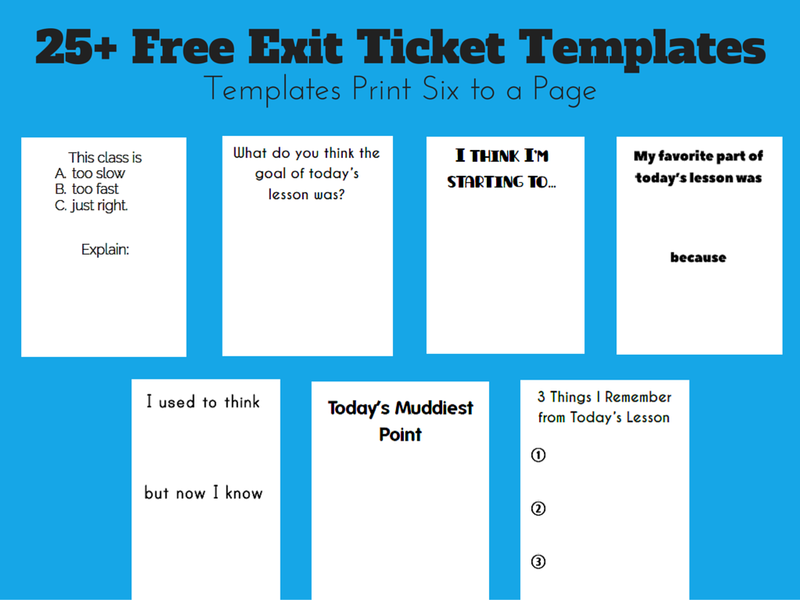 It instantly brought to mind the exit tickets I used to give my students at the beginning of my first year of teaching. As a pre-service teacher, I read tons of teacher books and read every math teacher blog I could get my hands on to help me learn how to best run my classroom. All the advice seemed to point to using every minute of class wisely and bringing closure to every lesson. So, I jumped into giving exit tickets every single day. This did not last for long. First year teacher me was overwhelmed with all the tasks that teaching brings with it, and this was one thing that fell by the wayside. I think the reason it fell by the wayside so quickly was because it was an extra thing that had to be planned every single day. Now, as a teacher going into her fifth year of teaching, I realize the importance of automating as many things as possible. I want to get daily feedback from my students. I want to get to know my students better. I want to know which concepts they are grasping and which concepts are making them grasp at straws. Sure, I could probably make up exit ticket questions off the top of my head now and be just fine flying by the seat of my pants. But, I've got a better plan. I'm taking my favorite exit ticket questions and making sheets for each question that can be printed and chopped ahead of time. Each day, I'll be able to pull out a prepared stack of exit tickets that match what I'm hoping to learn from my students that day. I did an online search for exit ticket ideas and compiled my favorites. These should be able to be used with almost any subject/grade level. I've designed them to print 6 to a letter-sized page. I'm thinking this will make them easy to chop with the paper chopper.